This is a fine, grand, little-visited church. 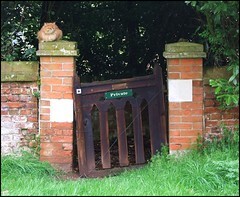 It stands in fields near the ornate gateway to Assington Hall. But the Hall burned down half a century ago, and now St Edmund has a more exotic and somewhat surprising neighbour, a field with llamas and alpacas in it. You approach it by a driveway from the Boxford to Bures road. The whole church was largely rebuilt in the 1860s, using the original materials. The architect seems to have been the vicar himself; not as unusual as it sounds, in those days of a renewal of interest in liturgy and decoration. The church was largely rebuilt in its original style, judging by drawings from earlier in the 19th Century; that is, of the late Medieval period. Its tower is a grand one. It would be interesting to see it in a couple of centuries time, when it has matured a bit. To the east of the church is one of the most spectacular churchyard memorials in Suffolk, a great column surmounted by angels, set on a base which remembers generations of the Gurdon family. It is the first inkling that this is a church to come to if you have an interest in monuments; as at Sotterley and Helmingham, you can follow the lives (and deaths) of a single family over the centuries. Before going inside, I pottered around the graveyard, noting a magnificent churchyard cat, a great fluffy ginger tom who sat on a gatepost to a neighbouring house and regarded me diffidently. Nearby, a headstone remembering someone who had died nearly a century ago had fresh flowers on it, which I thought was lovely. And then I stepped in through the south doorway. it was a Saturday, but if it had not have been then I fear access might not have been possible. 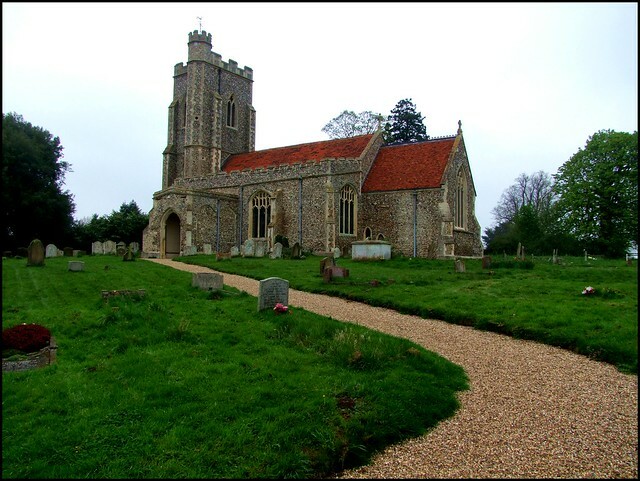 It is worth noting that more Suffolk and Norfolk churches are open every day now than were ten years ago, which is good. But there are several places, like Assington, where the change has been made in the opposite direction. This is not because of suspicion, or vandalism, or a lack of welcome, but simply because some congregations are now so small it is no longer possible to ensure a full key rota. Be that as it may, the Gurdons seem to have been a muscular lot; like the Barnadistons at Kedington, they were enthusiastic puritans and parliamentarians, but made themselves useful enough to receive free and full pardons after the Restoration. From then until the 19th century, they were presenting their younger sons to the living, in the Suffolk manner. There are some flowery descriptions of them on the various memorials, and you might also think that the family had an affection for winged skulls, which abound. Apart from its monuments, this isn't an earth-shatteringly important building, and I don't suppose that it gets many visitors. But it has a real atmosphere of the 19th Century revival, and to sit here for a while is to commune with the shepherds, blacksmiths and ploughmen of the not too distant past of rural Suffolk. Hopefully my pictures will encourage you to make the same visit yourself. There is a chapel of ease a mile or so away at Leavenheath, which is also worth a glance if you are in the area.